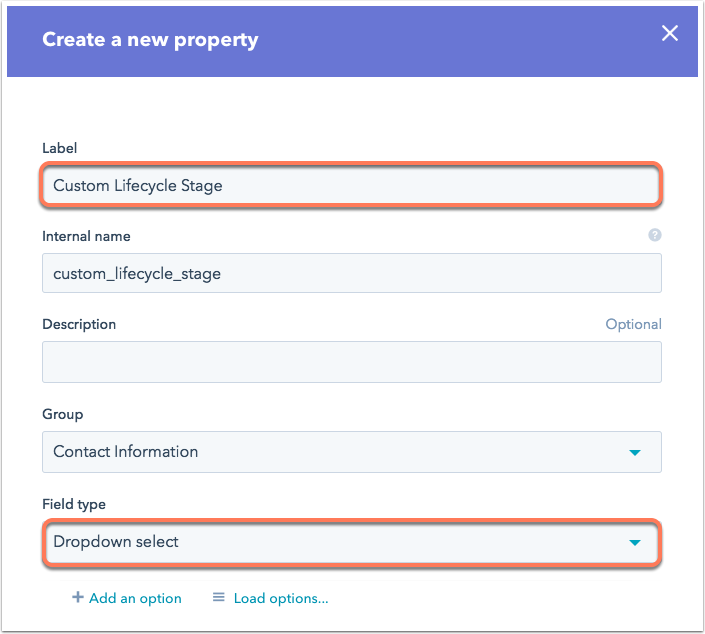 By default, HubSpot includes a Lifecycle Stage property The default Lifecycle Stage property is not editable, but to accommodate your company's needs, you may need to create your own custom lifecycle stage property. Do note that this property will not be able to replace the default Lifecycle Stage property. Click the Actions dropdown menu and select Edit properties. Make sure that you are under the Contact properties tab and click Create a property. Enter your Label, such as 'Custom Lifecycle Stage Property' or 'Contact Type'. Click the Field type dropdown menu and select Dropdown select or Radio select to give users or tools the option to identify one single option per contact record. Click + Add an option. Enter your first option in the Label field that appears. Continue to add property options. If you want to use this property as a field in your forms, click to toggle the Display externally switch on. Select the Group you wish this property to appear within your contact records and elsewhere in HubSpot. You can enter a Description to help users understand what this property is used for.